'One of the best books of the year' Hello!The joyful, sharply observed and life-affirming Christmas story for fans of One Day. Also a Radio 2 Bookclub pick. It's Christmas, and the Birch family is gathering for the first time in years. Olivia, the eldest daughter, has returned from treating an epidemic abroad and must go into quarentine for seven days. Her mother has decided it's the perfect opportunity to spend some 'sepcial time' together. Her youngest sister wholeheartedly disagrees. Her father isn't allowed an opinion. When no one can leave the house, seven days for the Birches feels like an eternity. Especially when they're all harbouring secrets. One of whom is about to come knocking at their door... 'LOVED it! 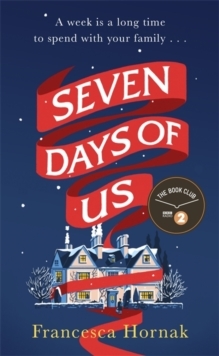 Warm and humane, funny and sad, with a great, twisty plot, Seven Days of Us is absolute pleasure reading from beginning to end. Francesca Hornak is a true talent. Just gorgeous!' Marian Keyes'I loved this comic drama . . . the plot is genius . . . and the results are hilarious and touching' Daily Mail'Sharply observed by Hornak's satirical eye, this has "Working Title film deal" written all over it' Glamour'Francesca Hornak is hilariously funny with characters that jump off the page, grab you, and just won't let go' Rosamund Lupton, bestselling author of Sister 'Expertly captures the joys and the tensions of spending any time with those who know you best. It thoroughly deserves to be this year's big Christmas hit' The i'Absorbing, insightful and immensely enjoyable' Laura Barnett, bestselling author of The Versions of Us'Compassionate, witty and wise' Saskia Sarginson, bestselling author of The Twins'I LOVED Seven Days of Us. The story swallowed me up. It has all the makings of your classic rom-com, with characters that are both remarkable yet wonderfully relatable, thanks to Francesca Hornak's acutely observational storytelling. The family tension is all too real. Brilliant!' The Unmumsy Mum'Gripping, powerfully emotional and life-affirming. I read it in one sitting!' Maeve Haran, bestselling author of Having it All'Touching, funny, emotionally intelligent, Seven Days of Us is pure pleasure from beginning to end. It's stylishly written and totally engrossing. I really, really loved it' Adele Geras'It's a cliche to say this book is a rollercoaster but the sun came up and the sun went down, people cried for help, and the bath overflowed, and I couldn't move, captivated by this extraordinary page-turner. The plot is compulsive and doesn't let up till the very last chapter. It has more twists and turns than Hampton Court Maze and yet Francesca Hornak guides one through it all with a confident hand until one puts it down, exhausted but exhilarated by such a rollicking good read. Terrific' Virginia Ironside'An engrossing and funny study of a middle-class British family in crisis. I loved it!' Keith Stuart, bestselling author of A Boy Made of Blocks'Witty and deeply heartfelt' Bestselling author Emily Griffin 'Hornak's wry, masterful portrayal of a family in crisis is filled with flawed and funny characters who will capture - and break - your heart' Fiona Davis, bestselling author of The Dollhouse'Hornak's first novel is a farcical gem, perfect for fans of Matthew Norman and Emma Straub.